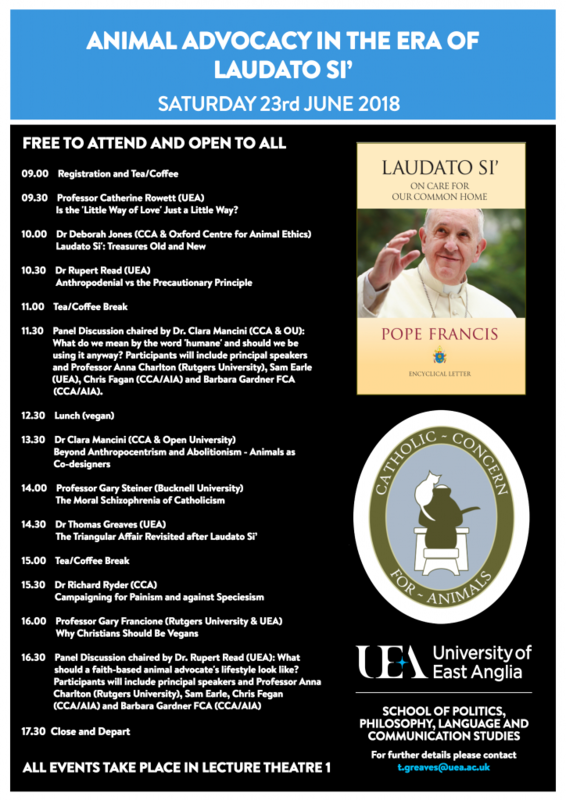 All are invited to attend the special “Animal Advocacy in the Era of Laudato Si” one day conference, Saturday 23rd June 2018 in Theatre 1 at the University of East Anglia in Norwich. The conference is jointly organised by UEA and Catholic Concern for Animals. Details below and also available on CCA’s website. The Conference is free (including a vegan lunch), and to encourage attendance QCA are offering to its members a special travel subsidy to a maximum of £20 available by advance application to our Treasurer (please use our Contact form) and presentation of receipts.